I spent one night in Sardinia and didn’t want to stay for more time because I thought it would be too hot if I continued going south. I met some guys from Slovenia who had done the entire coastline of the island. I wanted to try to sneak on the boat to mainland Italy, because they didn’t check my ticket on the ferry from Corsica to Sardinia. 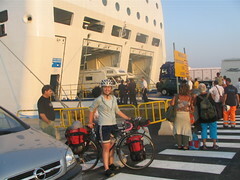 The port at Sardinia had a lot more security, though, so I bought a ticket for 48 euros. The boat was huge. I slept in a quiet hallway and wasn’t really bothered. The next morning, we landed at 6 30 am and it was great to get an early start on the day before the heat came. Wow, what a big ferry! How long did it take? Wow, this is trip is doing wonders for you. Up at 6:30 am!